Thora, your time before the Gods has come, again! After having been successfully funded on Kickstarter, Montreal based developers Thunder Lotus Games, were able to bring their epic Norse mythology focused, hand-drawn work of art, called Jotun, to Steam in 2015. In the year that followed though, Jotun would reach new heights thanks to the addition of a new mode, a rebranded title and a release on PlayStation 4, Xbox One and the Nintendo Wii U. Granted the Nintendo version couldn’t graphically compare against the Sony and Microsoft ones, it did however support off-TV play, thanks to the Wii U GamePad. So, if a loved one wanted to watch their favourite soap and you wanted to play, the both of you could get your way, without either one of you having to leave the room. Having handled the Wii U review of Jotun: Valhalla Edition myself, I was immediately take by Jotun’s illustrated graphics and inspiration. Growing up in the UK, Norse cultures and their beliefs was something that popped up during History lessons, so it was great to be able to play something that took what I learned a long time ago and presented it all in a much more enjoyable means of brushing up on it/learning. More than that though, if it wasn’t for SteamWorld Heist, Jotun: Valhalla Edition would have been my favourite indie game for the Wii U and a Switch port is something I have been wanting ever since the Wii U version released. 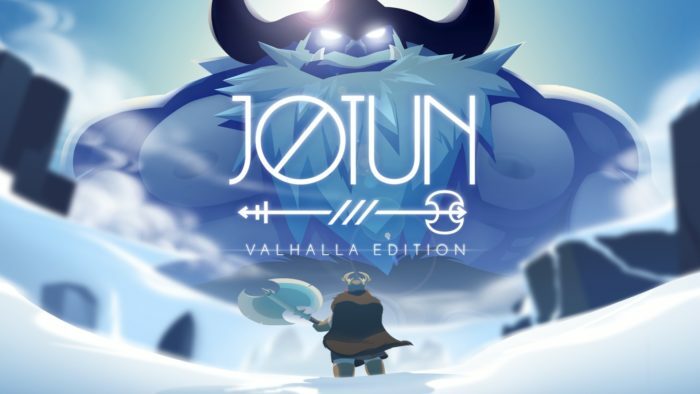 Clearly, my long awaited wish did come true (fingers crossed Sundered will get the same treatment,) as Jotun: Valhalla Edition is out on Switch this April. But, will it be as good the second time around on a Nintendo platform? The short answer is, Jotun: Valhalla Edition is as good as its previous incarnations, but don’t expect too much from it. If you have played the Wii U version, you will notice a visual upgrade, as the Switch version of Jotun is on par with the other versions, but by no means is it made for Switch. There’s no HD Rumble, there’s no touch-screen support and during the time of playing and writing this review, there wasn’t even support for Screen Capture either, although that last one isn’t the fault of Thunder Lotus Games, as they didn’t know they were responsible for implementing it until tool late, but a patch to add it is in the works and could be out before we know it. If in the event none of that bothers you, which it shouldn’t, as Jotun is as much of a fantastic title, as it was seen in 2016, if it never popped up on your radar before, here’s the only lesson you could really need on it. As an action-adventure game, the tale and events of Jotun revolves around the journey of a female Viking named Thora and it is jam-packed with factual Norse mythology. Having suffered an inglorious death Thora is not welcome into Valhalla, but that does not mean she is not given the chance to impress the Gods and prove herself worthy of entering Valhalla after all. So, with such an option in place, the main campaign of Jotun: Valhalla Edition follows Thora’s efforts of redeeming herself. Naturally though, proving one’s worth is never easy and for Thora, it’s especially no cakewalk, as not only will she have to traverse strange lands, but upon successfully navigating them and discovering their every secret and gathering each Rune, an epic battle awaits. Gigantic monstrosities known as the Jotun must be defeated and failure to acquire the power of the Gods, will soon see Thora’s quest fall short a lot sooner than intended. I mean, sure, she has a two handed axe that can be used for a quick, yet weak swing (press Y,) or a strong attack (X,) but steel can only do so much against the 5 dreaded elemental giants. But, even though the powers of the Gods is the way to win, Thora will first need to prove she’s even worthy of wielding them, but at least the only requirement for that, is finding the shrines that belong to the Gods. Now, although one could argue that more realistic graphics might have served Jotun better than the lighter palette and friendly look it’s hand since release, but honestly, it really doesn’t matter. There are still plenty of moments when the screen will pan across and you will find yourself saying “Wow!” and the story is so engaging throughout, thanks to the way new story details and background information are handled that you’ll soon find yourself too invested in Jotun to even wish it looked more like Skyrim. (Although thinking about it, a Skyrim looking Jotun would be out of this world incredible, but I’d happily play the version we have right now than wishing for one we’d never get.) But, at the risk of doing one more piece of unnecessary praise, because of how well story and details are handled, Jotun does have plenty of replay value, as it is always fun to experience certain scenes over and over. Admittedly though, the main campaign can easily be bested in 4-7 hours. To counter positive praise with a negative comment though, although it has replay value, Jotun only has 2 modes, story and Valhalla Mode, aka the mode in which puts the Valhalla into Valhalla Edition. Instead of being another campaign that’s harder than the one you play as part of the story, it’s a boss rush mode that pits you against even tougher versions of all the diabolical bosses you have to face in the main campaign. Now, my skills at Jotun may have improved since my first ever playthrough on Wii U, but those bosses are still maddening and fully capable of laying down the hurt when I mess up. On the plus side though, my nemesis Hagalaz no longer torments me like he did last time and poses much less of a threat. But, before you can even hope to go toe-to-toe with a fate worse than death, with Valhalla mode, there are still 9 mesmerising levels to venture through, packed with puzzles to solve, trees to cut down, boulders to roll and Golden Ithunn Apples to munch on, as they bestow you with more life. There’s also bad guys to kill, but nowhere near as many as Jotun could have had, so you never really get overwhelmed, but then, Jotun isn’t about the small fry. It’s about the big fish and because I have yet to talk about the 6 God Powers in proper detail, let’s correct that. Although you are limited with how much of each one you can use, how you use them matters. For instance, using Freya’s Speed and Thor’s Hammer at the same time, can result in you dealing some serious damage, and you can deal some serious damage. Although, both Thor’s Hammer and Odin’s Spear are good at doing that on their own. I do however have a complaint with how the powers are implemented though, as even though it’s a similar case to other console versions, with shoulder buttons being able to cycle through the powers you have and one button being used to activate it (A for Switch,) when playing on the Wii U, the GamePad actually allowed you to do it all via inputs on the screen, which also allowed you a good look at the map. Having found it an effective means of tackling the Jotun and level exploration, for the Wii U version, I actually really miss it and found myself having to adjust, as it is something of a step-down. Still, I didn’t dislike its absence enough to let it put me off Jotun altogether, because it’s still a beloved work of art that I could never turn my back on. I may not have impressed the Gods with my performance before, but just like in 2016, Jotun: Valhalla Edition is still very much so the Viking epic that I fell in love with and I am happy to report that it still impresses me now. It’s a great game that is worth the double dip on, but although I wouldn’t say Thunder Lotus Games were lazy with the port, as Jotun does run smoothly, but the Switch version had the potential to be the best and it’s not. Yes, you can play it anywhere and it’s on par with the versions but some touch-screen support to mirror the GamePad’s functionality for the Wii U would have been nice. So although I am overjoyed to have it on Switch and still get excited when playing it, but I am a tad disappointed that what we did get, wasn’t something a tad more. At the end of the end of the day though, reviews are subject to opinion and that’s just mine.